Level 2 - Advanced to Intermediate. The Introduction level begins a journey of growth and exploration towards a new self-leadership for the future. It will introduce you to the principles and practice of coaching and leadership and provide an insight into a level of purpose that is deeply motivating. 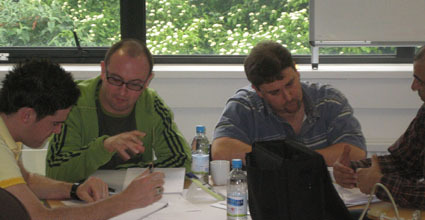 The programme incorporates a range of highly interactive learning modes and motivational techniques and approaches, including real-life coaching, presentation, observation and feedback, a 140-page reference manual and handouts. Most importantly, it will allow you to explore and experience rather than ‘learn’ the foundations and essence of coaching – essential to the development of authentic and powerful coaching. In the weeks following the 2-day training you will be supported in developing yourself as a coach through coaching practice, assignments, 2 group supervision calls, a coaching diary and self-assessment tool which are designed to focus on creating conscious competence around the key coaching skills which were developed in the training and building on the important foundation of the intuition you have begun to tap into. The more coaching you are able to build into your work and everyday life, the more confident and natural you will become at coaching yourself and coaching others to integrate performance and purpose, and so release the greater potential and brilliance that lies within us all. ... to be explored further in Level 2 and Level 3. During the 2-day training, focus is turned towards real-life coaching practice, with support and feedback from experienced, executive performance coaches. Following the training, participants will be given coaching assignments and receive group supervision and feedback calls and email support. On attending and successfully completing all requirements for Level 1, you will receive a Certificate of Professional Development. By completing ECT Level 1 and Level 2 you will fulfil the ICF coach-specific training requirements for a Portfolio Application to become an Associate Certified Coach (ACC). Additional requirements you need to meet include documentation of coaching client hours, self-study, group and one-to-one mentoring, references from observation of your coaching and completion of the ICF's oral exam by telephone. Please let us know if you wish to follow this path of development. We will be happy to explain the certification requirements in detail. The course is divided into two parts consisting of two 2-day modules. Focus is turned towards real-life coaching practice, with support and feedback from experienced, executive performance coaches. In between sessions, participants will be given coaching assignments and receive group supervision and feedback calls and email support. Participants can choose to work individually with a master coach and receive one-to-one telephone coaching during and after the training (price on application). These sessions can be used for personal supervision and feedback and, if combined with the full Mentor Call Package, will count towards ICF certification requirements. The ICF requires you to work with a qualified mentor coach in order to help you prepare for the ICF portfolio exam and its oral demonstrations. You require a minimum of 10 hours of mentoring, of which at least 3 hours must be one-to-one with your mentor, over a minimum period of 3 months. The format of our group mentor calls is such that you will experience as much supervised practical coaching as possible. On attending and successfully completing all requirements for Level 2, you will receive the qualification Certified Executive Coach. This highly regarded qualification from Performance Consultants will allow you to pursue a challenging and rewarding career in coaching. By completing ECT Level 1 and Level 2 you will fulfil the ICF coach-specific training requirements for a Portfolio Application to become an Associate Certified Coach (ACC). Additional requirements you need to meet include documentation of coaching client hours, self-study, group and one-to-one mentoring, references from observation of your coaching and completion of the ICF's oral exam by telephone. If you have a group of people that you would like to put on this programme, please contact us directly as programme fees indicated are for the attendance of one person only.